Back in the summer of 2013, as our Locost was nearing completion, we started to get anxious. Just about everything was installed on the car. The engine was running and we only needed a few more components to take that historic first drive. These included minor things like the shocks and driveshaft, and also the body, although we weren't really sure that was a key component. Anxious as we were to finish the car and get it out on the road, we started to rush things, particularly things we weren't entirely sure how to do, like for example the carpets. Back then, no Locost in the history of Locosts, as far as we knew, had carpets, so anything we did in that regard would be a bonus. But we weren't sure how to proceed. We thought the transmission tunnel should be carpeted, and also the floor, but all of the other details were a little sketchy. 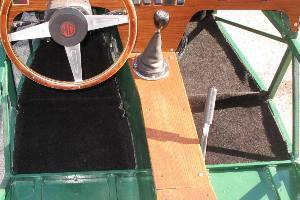 One thing we did know, having seen carpets in real cars, is that the edges of the carpets needed to be hidden under plastic panels. This was a problem for us, because we didn't have any plastic panels. So we needed to come up with something else. After some investigation, we discovered that real cars don't always have carpet edges hidden under plastic panels. This seems like a major fail if you're a big-time car manufacturer, but if the carpet in a real car comes up short, the edges are at least finished with some kind of vinyl binding. So that was our plan, to bind all of our of carpet edges, and that took us on a trip to our local Jo-Ann's fabric store, where we learned, unfortunately, that Jo-Ann is not hugely interested in the lucrative automotive fabric market. 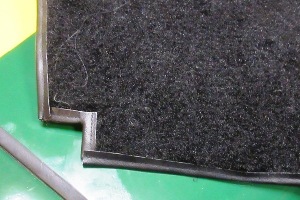 This was a real setback, but as we noted earlier, the rush was on to complete the car, so rather than waste more valuable time looking for vinyl carpet binding, we cut the carpets out and left the edges raw, then slapped them in the car so we could start working on more important things. We knew at the time it wasn't the ideal solution, but we figured, what the heck, we could always redo the carpets at some point down the road, maybe even sometime during the winter months when it's cold and raining and we can't drive the car anyway. Like for example right now. Due to the lack of binding, over the years our carpet edges have frayed. Somehow that never really bothered us. What did bother us was that the carpets would no longer stay put. During the initial installation we avoided using any sort of adhesive on the carpets, as that would've taken even more time and precluded us from ever replacing them. So we attached Velcro, or a cheap substitute thereof, to the floor and carpets, and that worked for a while, but then the carpets started moving around and bunching up and we had to straighten them out every time we got in the car. We could've fixed this by gluing the old carpets down, but two things. One, the old carpet edges were frayed. It wasn't a good look. Two, over the years the carpets absorbed a fair amount of chemicals that either a) didn't evaporate, or b) continued to spill onto the carpets on a regular basis. It started with antifreeze, back when the car was new and boiling coolant was constantly erupting from tanks and hoses in the engine bay, and was later augmented by hydraulic fluid, engine oil, coffee products, and anything else we might've picked up on the bottom of our shoes. So the carpets always seemed a little damp and/or greasy, and replacing them seemed like a good idea. 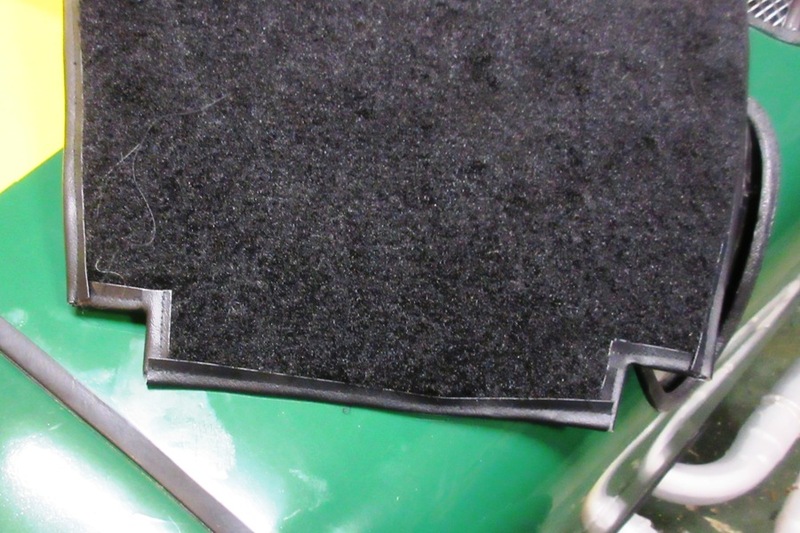 So last September we ordered two yards of luxury automotive carpeting from one of our favorite online vendors, whose name escapes us right now, along with six yards of genuine vinyl automotive carpet binding. Jo-Ann's loss. The order arrived a couple of months ago, back when the weather was nice and we were still driving the car pretty much daily. Which explains why we didn't actually get around to replacing the carpets until last week. 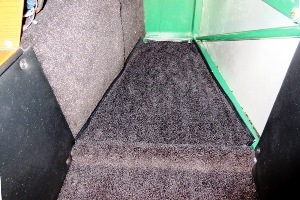 The new carpets have two major improve­ments. Three, if you count the fact that they're clean. First, we extended the sides a couple of inches in back so they can be secured under the cardboard side panels. This should help to keep them from moving around in that critical area in front of the seat, where you first step into the car and unsecured carpet with failed Velcro slides around and bunches up. The second improvement is full binding of all of the raw edges, using genuine vinyl automotive carpet binding and our trusty Singer sewing machine. It turns out that binding carpets is not a job for amateurs, or anyone hoping they might get lucky despite being an amateur. Once again, in order to showcase our work we had to resort to a long camera focus and careful selection of the resulting images. 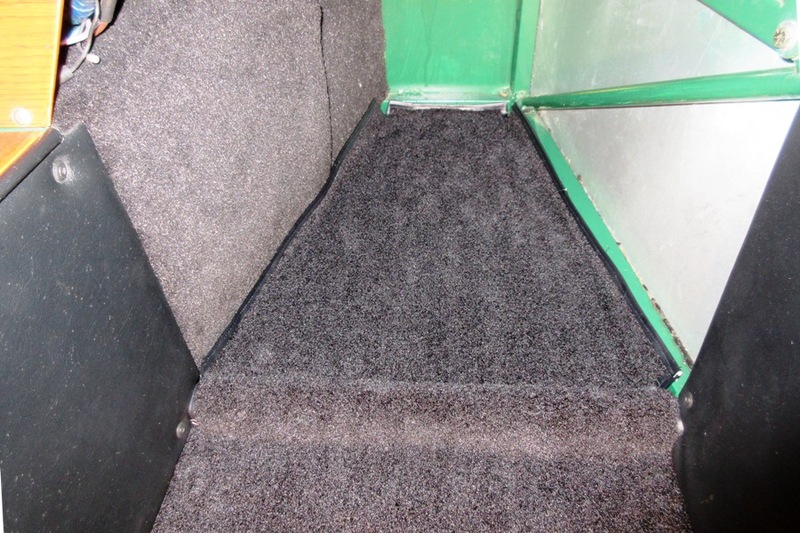 Our skills did improve as the job went along, and we think our crudely bound seams look better than raw carpet edges, although not a lot better. But we think we'll be happier with them in a couple of years, by which time raw edges would've frayed badly. Unless the binding comes apart, which it probably will. But right now the new carpets look great. They don't feel greasy at all, and they don't even have a lot of lint, hair, leaves, or other grit embedded in the fibers. That comes later. We're thinking about adding floor mats to protect them. 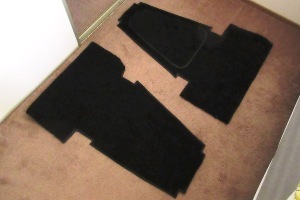 We had floor mats on the old carpet, but they came out of the back of a Toyota and didn't quite fit. Or fit at all. We're thinking we could make our own, but we've been fooled by that kind of thinking before. Many times. We'll take a look down at our local Ace hardware store and see what they've got, then let you know. 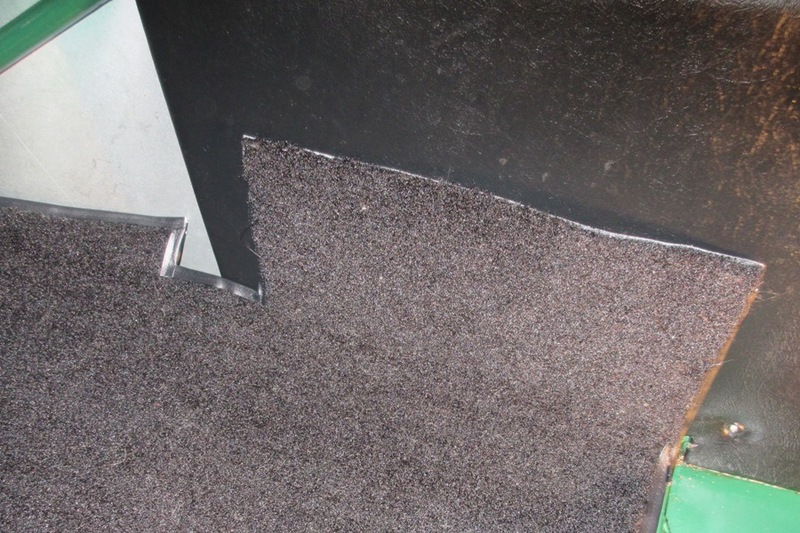 Replacing the carpets was a major item on our punch list of needed Locost tasks. This is how we imagined the carpets would've been done in the first place, if we hadn't been in such a hurry to finish the car. We'd actually expected to paint the grille last week, a task that was higher up on our list, but the carpets were starting to look really bad, and the grille looks mostly unchanged after two years, except for a little rust. We'll get to the grille soon. We're not on any kind of schedule, but we did get invited to the Bay Area Maker Faire in May again this year, and we'd like to have the car in presentable condition by then. So we're on a little bit of a schedule.